We provide septic engineering services in the Odessa, FL area and can build and install the perfect system for your property. If you don’t have access to a waste processing facility, you may have considered having a septic system installed on your property. However, since your property is unique, you need a team that can engineer a system that accounts for your property’s specific features. This is where our team at Southern Water and Soil comes in. We provide septic engineering services in the Odessa, Florida area and can build and install the perfect system for your property. When you turn to us to take advantage of our septic engineering services, our licensed engineers will rely on their experience and knowledge in the septic industry to create a functional, efficient system for you. However, the main reason why you should let us take over your septic system creation project is because we are committed to ensuring that your system meets your specific needs. For example, if you run a large commercial building that handles a lot of waste and water every day, we can devise a system for you that will easily handle this situation. In addition to creating new septic systems, our septic engineering experts can also help you add something different to your septic system. For example, if you are interested in equipping your property with a drip irrigation system, we are the ones for the job. If you have any questions about our septic engineering services and why you should let us at Southern Water and Soil meet all of your property’s septic needs, please don’t hesitate to reach out to us. At Southern Water and Soil, we offer septic engineering services in Tampa, Odessa, Lutz, Land O’ Lakes, Brandon, Orlando, Plant City, Dade City, Bartow, Lake Wales, and Lakeland, Florida. From permitting to ongoing maintenance, you can count on us at Southern Water and Soil for all your septic needs in the Tampa, FL area. Purchasing or replacing a septic system, whether it be for a commercial or residential site in Tampa, Florida, is an investment. At Southern Water and Soil, we can help you with all aspects of the design, permitting, and installation process to ensure the functionality and efficiency of your system for years to come. We do things right the first time, carry all proper licenses, and have extensive experience designing and building septic systems for unique building sites and applications. 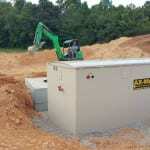 Looking to install a septic system that works well for your property? Tampa, Odessa, Lutz, Land O’ Lakes, Brandon, Zephyrhills, Plant City, Dade City, Bartow, Lake Wales, and Wesley Chapel, Florida.